The 2000 One Pound Coin. 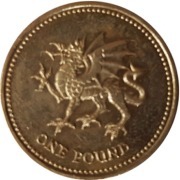 The Reverse shows a Dragon passant representing Wales. It was designed by Norman Sillman and used in 1995 and 2000. The Edge Inscription is PLEIDIOL WYF I'M GWLAD which means 'True am I to my country'. Images are supplied by UKCoinCo. 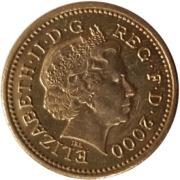 If you are interested in buying a 2000 One Pound Coin - Dragon then visit http://ukcoinco.com/product/2000-one-pound-coin/. UKCoinCo also purchase coins and coin sets. Mintage: 109,496,500 (may include coins issued as part of a set). Minted at The Royal Mint. 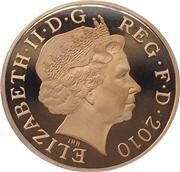 The 2000 One Pound Coin - Dragon (a British one pound (£1) coin) is a denomination of the pound sterling. Its obverse bears the Latin engraving "Dei Gratia Regina" meaning, "By the grace of God, Queen" and FD meaning "Defender of the Faith." 2000 Welsh Dragon £1, One Pound Coin, Coin Hunt.